Join us at The Bumbles Blog every Monday! The feature presentation this week is all about movies with great ensemble casts. 1. 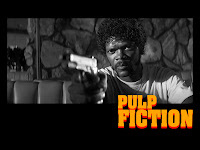 The first one that comes to mind is Pulp Fiction (1994). Although I didn't really care for this movie, it has some great names in film: Samuel L. Jackson, John Travolta, Bruce Willis, Uma Thurman, and Rosanna Arquette, to name a few. A good gangster flick for the guys. 2. Another one that I also felt was a good date night movie is Valentine's Day (2010). Great movie, and great ensemble cast: Jessica Alba, Kathy Bates, George Lopez, Ashton Kutcher, Patrick Dempsey, Jennifer Garner, Hector Elizondo, Jamie Foxx, Anne Hathaway, Queen Latifah, Topher Grace, Taylor Lautner, Taylor Swift, Julia Roberts, Emma Roberts, and Shirley MacLaine. Whew! That's quite a cast of "names!" Makes for one sweet assortment! 3. Last, I'm reminded of a great ensemble cast, and an all female cast, in The Women (2008), another movie I loved. Annette Bening, Goldie Hawn, Eva Mendes, Jada Pinkett Smith, Bette Midler, Candice Bergen, Carrie Fisher, Cloris Leachman, and Debi Mazar. They make a cheating husband and finding yourself fun to watch. Ooo - ooo - ooo! Your mention of The Women reminded me of another great ensemble movie - Steel Magnolias! What a terrific cast, plot, everything. Even guys liked that "chick flick." I need to see valentines day and women. But never got there. have only seen pulp fiction out of the 3 examples.. I loved that movie! The other two sound great! I just saw The Women last month and I did love the cast. Great pick!